The England Performance Pathway is a vital part of improving the standard of competitive netball played in England, with its main aim to ensure there is an increased number of better quality athletes progressing from the Academies into the England High Performance programme and INTCs (Intensive Netball Training Centres). 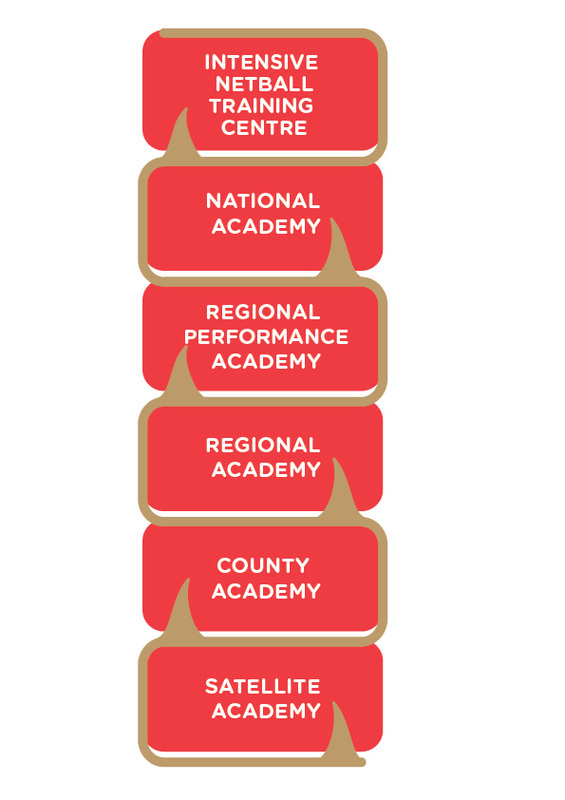 The Performance Pathway will act as a conveyor belt for high quality English athletes, taking players from 11-12 years old, all the way through to our Senior National team. As you may be aware England Netball has a newly introduced Netball First Pathway Programme. The aim of the pathway is to develop athletes with the necessary attributes to perform. ​Essentially the Satellite Academies are for players who are of a good netball standard and have the potential to improve into a performance player. The County Satellite programmes focus on quality and not quantity, providing performance-enhancing training for the individual, not squads. Competition is seen as valuable but is delivered outside the Netball First Pathway programme in club or school local leagues and tournaments. As part of the Netball First Pathway, Nottinghamshire will be running 1 Satellite Academy screening day in October for girls who are currently 11, 12 or 13 years of age. The cost for screening will be £5 per player, payable on the day of the players screening. Please visit our website for further information regarding age banding and training nights. Please find below the nomination forms for athletes to take part in the ‘Northants Netball Performance Programme’. NB – Nominations are for girls who are entering year 7, 8, 9 or 10 in September 2016. No nominations will be accepted for girls younger or older than this. The Northants County Netball Performance Programme has been developed to ensure that the game is both player centred and in line with long-term athlete development (LTAD). Should your nominees be successful at this screening day they will be asked to attend a further 4 weeks of assessment commencing in September 2016; there will be a charge of £35 for this second phase. The programme will begin in October 2016 and will run through to July 2017 on a fortnightly (at present) basis for the Satellite groups and weekly for Academy groups; the girls will experience high quality coaching and education on various aspects of the National Performance Pathway, giving the athletes the opportunity to reach their maximum potential. Should you have any questions please do not hesitate to contact either me via email stacey_poole@live.co.uk or Sophie Vickers sophie_vickers99@hotmail.co.uk. I would like to take this opportunity to wish your athletes every success within the programme. Please use the documents below for loads more information!